Working with retailers in the café and restaurant sector I can categorically say, in order to be in the forefront of your game you really need to adopt the latest technology trends. By now, it has become clear that the cloud is not simply a fad, it is a business computing model that is here to stay. Cloud applications effectively deliver multitudinous efficiencies that ensure cost savings in the long run as well as keep you ahead of your competitors. Cafés and restaurants gain a great deal by adopting the latest cloud based POS and accounting systems that enhance their business. Cloud based programs have the capacity to enhance and expedite the system upgrade process. There are rarely any changes to hardware for cloud based upgrades, it is easier to experience a more seamless process. This has the potential to completely eliminate the need for an on-site computing and technology infrastructure — saving retailers an exceptional amount of money. A typical Café or Restaurant today would deploy SaaS solutions, which provide universal access to the system anywhere anytime, is simple to use and easy to setup. A good internet connection is paramount although, some software do have offline capabilities. Your data is safely stored on remote servers, and you have no concern about local breaches or equipment failure or loss of data. My ideal selection of software for Café and Restaurant businesses starting out or are willing to upgrade in order to gain their competitive edge would be Kounta with an extension of useful add-ons integrated with the top accounting software like, MYOB, Xero or Quickbooks Online. As these systems are cloud-based, the add-ons are a snap to add. Let’s dive into a typical setup for your café or restaurant that will make you run more efficient and blow your competitors away! A savvy POS software which is easy-to-use and highly intuitive. Retailers can set up the system themselves, as a representative from the Kounta support centre walks them through the process step by step. There is also a great array of videos and support notes to help guide you. Retailers have the option of starting fresh with new hardware, or they can opt to use their existing equipment. It can be used on iPad, Android, Mac, PC and now connects with Albert which is a clever EFTPOS tablet supplied by the CBA for a merchant fee. If you are not tech savvy you can always engage consultants like us to help you get setup faster. Kounta comes with powerful add-on features like inventory management, real-time reports, CRM, Loyalty to name a few. A cloud based kitchen display platform compatible with Kounta to revolutionise the way orders are received in production areas like kitchen, bar, restaurant and coffee stations. Manage your productions dockets just like you would with paper without the cost of printing. Mobile ordering and payment service app that integrates with Kounta. Boppl allows your customers the convenience to place their order using their mobile phone, pay upfront and receive notifications when their orders are ready for pickup. This allows you to focus more on customer service and satisfaction. Allows you to reward your customers which in turn keeps them coming back. It is a powerful way to gain repeat business and increasing sales by encouraging friend referrals. Collect Rewards is an easy to operate system and fully customizable to suit your business. It is also a great way to connect with customers. It also integrates seamlessly with Kounta. Takes cares of employee scheduling, time and attendance, task delegation, employee productivity and communication in a way they understand. Compatible with smartphones and allows you to run your business from your back pocket. It is easy to see who’s on, who’s late, who’s available to fill open shifts seamlessly. It also integrates seamlessly with Kounta. The final and of course imminent solution, I strongly recommend you integrate with your Kounta POS solution, is of course your preferred accounting software. All your cash up end of day process can be configured to export out of Kounta directly into your accounting package. This eliminates manual data entry and allows you to reconcile and keep you accounts up to date. 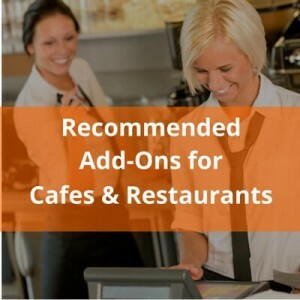 The aforementioned add-ons are by no means an exhaustive list; however, they provide specific added value to your POS and accounting software, which when effectively applied can decrease operational costs and improve the overall process. POS systems are evolving at an extremely rapid pace, and the ability to integrate sales data with all associated accounting responsibilities creates the ideal process for business owners to stay ahead of their competitors and grow their business. ** If you want to read more about add-ons, please check out ‘Our Preferred Add-Ons‘.